There has been lots of on-line chatter about Amtrak adding a Writers Residency program on their trains. Free trips to authors working on manuscripts. I jumped on the bandwagon and send out little notes to Via Rail and Rocky Mountaineer in hopes these two Canadian companies would follow suit. Then I took a reality check. If any of these companies offered such a program what would be the chance of winning a ride? I’m not on the cusp of being well enough known to get any mileage out of such a program so why would they pick me? Already losing the golden ticket, I thought about where I do my best writing. Then I knew a train had never produced anything worthwhile. So why waste any more brain power on the pursuit? I already have a “location” muse. And guess what? All winter long and well into the spring they give as close as it gets to a writer’s residency. 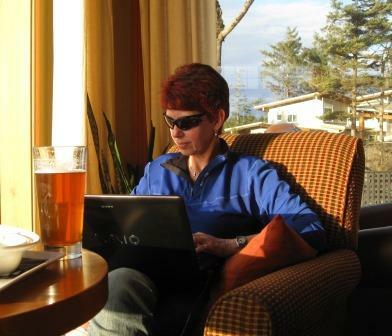 Long Beach Lodge offers rooms at a huge discount to solo travelers. And that makes for a writer’s paradise. I’ve done some of my best writing siting in their “great room”. The staff have become friends and indulge me with endless cups of coffee until noon then endless pints of beer until I leave at night. The respect they show for my writing space is endearing. Their encouraging words as they place another drink at my side are cherished. Maybe all writers are looking for a magical place to help the words flow. Or maybe writers are just people and the thought of a free train ride seems like fun. I could go on for a long time talking about the rooms at the Lodge, the view of the beach, massive waves, surfers, endless walks, comfy chairs and soaker tubs. Then it would all sound like a commercial for an upscale resort. So no more promoting the place. The last thing I want is for other people to be booked into my favourite room when I want to be there. This is more a comment in never forgetting I already hold the answer. I know where I write well. Long Beach Lodge or my favourite Vancouver lounge listening to my favourite music, or at my desk at 3am when an idea has woken me up and the need to tell a tale has to be played upon or forever lost. I think waiting to get a ticket for a train ride is only giving the power to someone else. my, my you look very focused so you must know what you’re talking about! Nothing like knowing what’s the best for you. I couldn’t agree more! I had the same thought when I read about Amtrak’s Writers Residency program. I got excited until I remember I fall asleep on trains. It’s a nice idea, but I know what works for me, and I’ve never included trains on that list.